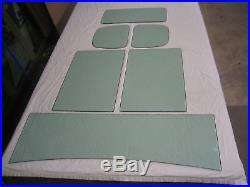 SET INCLUDES 1 WINDSHIELD 2 DOOR GLASS 2 QTR GLASS AND 1 BACK GLASS IN A LIGHT GREEN TINTED GLASS. ALL EXPOSED EDGES ARE SANDED TO AN ORIGINAL SATIN FINISH. ALL GLASS IS CUT IN OUR SHOP FROM ORIGINAL FORD PATTERNS GUARANTEED TO FIT EXACTLY LIKE YOUR ORIGINAL GLASS PARTS. IF ORDERING THIS GLASS SET PLEASE LET US KNOW THE EXACT YEAR OF YOUR MODEL A COUPE. SINCE 1984 VINTAGE GLASS USA HAS BEEN SUPPLYING AUTOGLASS FOR ANTIQUES CLASSICS STREET RODS HOT RODS AND MUSCLE CARS. The item "1930 1931 FORD MODEL A COUPE GLASS SET TINTED VINTAGE GLASS" is in sale since Monday, July 14, 2014. This item is in the category "eBay Motors\Parts & Accessories\Vintage Car & Truck Parts\Glass". The seller is "silex210" and is located in Tolland, Connecticut.